Gold, referred to as “tears of the Sun” by the Incas, is perhaps the oldest metal known to us earthlings and I just love this precious metal like no other. It’s shimmer. It’s depth. It’s richness. It all makes that part of my gut that’s connected to beauty and spirit just razzle dazzle with a rush of excitement. Oh and then there’s its connection to Ancient Egypt and Nubia where gold was considered the skin of the gods. The gold Ankhs and Usekhs never cease to blow my wig back. The history is fascinating and the aesthetic supreme and so it’s no wonder that the love for this precious metal made it’s way from the Pharaohs to hip hop’s pioneers and first fans. When I was a teen, sporting gold was a big deal. It was a marker for fresh to defness. Guys had their dookie dope rope chains ala Run DMC and girls, inspired by Salt-n-Pepa, had name chains and bamboo earrings. It wasn’t nearly as expensive back then, and so whether you we’re working at VIM or the library, babysitting or delivering pizza, you could make enough loot to cop that piece you put on layaway weeks earlier. Nowadays the value of gold has shot so high folks are being cajoled by big business conglomerates into turning in their “scrap” gold pieces for cash. I predict, in the not so distant future, the have and have-nots are going to be determined by the amount of gold in one’s coffers and drinkable water in one’s home. So now what’s a grrrl on a budget to do? Gold plated? Costume? Those are fine, but in the end something was missing for me. Then I read something about the energy possessed by natural precious metals and gemstones and realized that the rush I was feeling back in the day when I put on my gold lion head ring (incidentally Jay-Z’s now rocking a cheetah version) stemmed from my love of the ring, but also from the vibrational properties of gold that work to eliminate fatigue. You can’t get energy from gold-plated nickel. About 5 years ago I was walking down Prince Street in SoHo and this brother had a long table stacked with golden earrings, bracelets and rings with a sign that read “Anu Rock & Metal Jewelry.” I looked at him and asked is this all gold? “No sis, it’s brass,” he responded. I couldn’t believe my eyes. His pieces had the same rich gilt, but was a fraction of the costs. 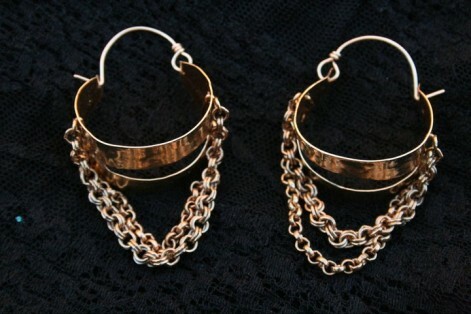 That day I bought a pair of hoops and made a connection with the creative genius behind Anu, Nkrumah Jennings, that is in tact to this day. His pieces resonate with the royalty of Egypt and the edge of hiphop. And brass, as he often shares, deflects negativity and attracts money. Now I see why both gold and brass are the metals of Oshun. She ain’t no fool! 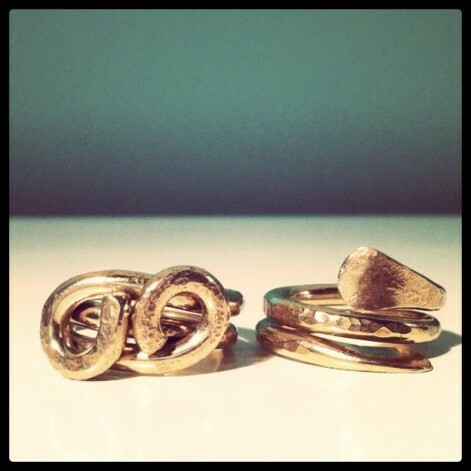 Now I own a brass necklace, and three pairs of brass earrings that always seem to turn heads and get compliments. When they begin to tarnish I just take a cloth with a little lemon juice and voila, they’re shining like nuggets of gold. 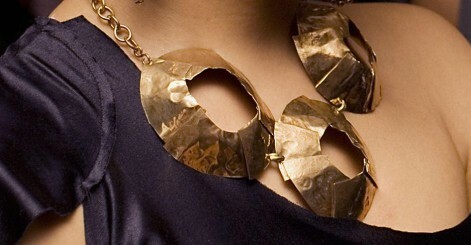 Brass is the perfect solution for me when I want the look and feel of gold but am not trying to shock my credit card. Not just for brass knuckles anymore, brass is perfect for those of us who like to look rich yet spend less. Another great attribute of brass is patina. When oxidized it will usually turn green or greenish blue. Not even gold can do this, never mind most other metals that rust under the same conditions. If turquoise was a metal it would look like oxidized brass. And the great thing about this patina is that it acts as a protection that covers brass and will not corrode or eat away at the metal. thanx so much nicole. you are a dope writer. this proves what i knew when we first met. that our meeting was a very valuable one. thanx so much for this.